I wasn't going to comment on the riots sweeping London and other major cities, because the blogosphere, TV, radio and newspapers is full of little else. However, two things have made me change my mind. One was listening to comments on the TV and radio from leaders on politics and the community, and the other was seeing that Nottingham had become embroiled in it all. I felt myself getting angry, frustrated and depressed, the more I listened to, and saw events unfolding. I just had to get some thoughts out of my system, and down in print. 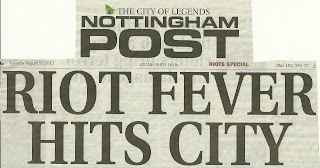 It's not all bad news though, as the final sub-headline was, "Forest v Magpies game will go ahead" - god forbid that civil unrest should affect a professional football match. The London riots followed a peaceful protest about the killing by the Police of a London man. I have no idea whether this man was carrying a gun or not, and listening to his partner speak on TV this morning, I'm none the clearer. She said he would walk away from trouble, and was a good man. It reminded me of a known thug in a town I lived in who was also shot during a Police raid on his home. To listen to his family and friends, you would think that he was to be nominated for sainthood, when it was well known how he terrorised the local community, and very few mourned his death. I also don't know whether the riots were co-ordinated, or simply each subsequent riot is just copying the other. Perhaps there is something in what the Chairperson of Hyson Green community group BOBS says, "I could sense it was coming. Young people do not seem to have the sense that you have to work for what you want. They think that they are entitled to it and can just take what they want. They have no scruples and no morals". What is it all about? This morning, a BBC newsreader was still calling the rioters, 'protesters', but protesting about what? They interviewed an inarticulate youth, who with his coat covering his head, in answer to the question what was he protesting about, said, "It's the Police, innit?" Well thank you for that piece of enlightened journalism. He then went back to his rioting and looting. The peaceful march was a protest, but what followed was nothing less than mindless, thuggish criminality. So who is in control of this situation? TV pictures have shown fire-fighters standing by while buildings burned as it was too dangerous to go in. Police lines have stood firm while watching buildings being looted. The Prime Minister has returned early from holidays, and his big decision is? To re-convene Parliament. Oh good, more hot air to add to the flames. The Home Secretary has declared her disgust, and promised that the perpetrators will be brought to justice. But the Police can cope, and there's no need to bring the army in. Our own Assistant Chief Constable in Nottinghamshire has said, "Faces have been captured on CCTV. Forensic evidence has been obtained. There will be absolutely no hiding place for these criminals responsible and they can expect to be arrested for their actions". The Deputy Leader of Nottingham City Council has said, "There is a message to parents that it is very, very important that you talk to your children, you know where they are and you take a proper adult responsibility". Come into the real world sir. There is no responsibility or control from thousands of parents - they lost it, if they ever had it, years ago. I'm sorry, but none of this is good enough for communities worrying about another night of riots in their areas. Who is in control? And what is going to be done to bring a halt to night's of violence and mayhem? I was listening to a London community worker on the radio this morning, who was saying that part of the reason for the disturbances was that young people's 'dreams and aspirations' were not being realised. Excuse me, but I've worked with many young people from disturbed, deprived and disaffected backgrounds, and for many the problem was that they never had any dreams or aspirations to begin with, let alone to realise them. Many of those that did have, worked hard to realise them, and clawed their way out of the slough of despond. And it's many of these people who have suffered through the night's of riot, looting and arson. I apologise to Archbishop Cranmer for nicking this photo from his blog site. It was one of the most moving and symbolic of the effect of the riots on innocent people. Take Aaron Biber opposite. 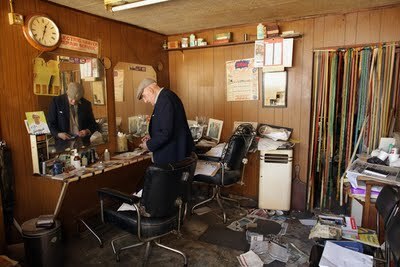 He's 89 years old, and has been running his Barber's shop in Tottenham for the last 41 years. Rioters trashed his shop, and stole his equipment, including his kettle. In Croydon, a family owned department store which had been run by them (five generations) for over 100 years was completely destroyed by fire. Small, independent shops in many high streets in London had been ransacked. Many of these owners had come from the very same communities as the rioters, but had made something of themselves, and the only good thing about it is their determination to re-open as quickly as possible. 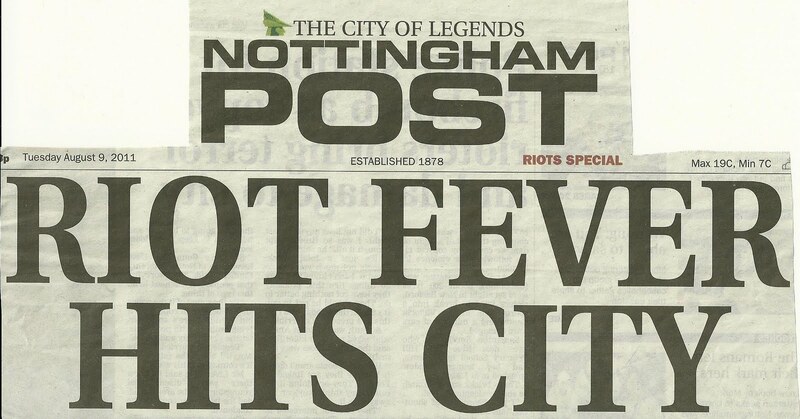 Of the St Ann's riots in Nottingham, the Assistant Chief Constable said, "The most appalling, and incomprehensible aspect to last night's events, is that the majority of those involved, we believe, live in the very community they attacked. It was their neighbour's home, their neighbour's car, their neighbour's peace of mind that they violated". Who is in control? And what is to be done? The politicians and police promise arrests and court action, but I remain sceptical. I anticipate a slap on the wrist or a small fine. The courts would much prefer to send the likes of 85 year old Norman Scarth to prison for six months. His crime? He illegally recorded a court hearing. Yes, he broke the law, but six months? The rioters, looters and arsonists with get off much more lightly. So what should happen? What isn't needed is more legislation, as what is currently available is more than sufficient, if only it is treated seriously. The days have gone when we can take seriously the words of the East Midlands MEP, Roger Helmer, who wrote on Twitter, "Memo to COBRA: Time to get tough. Bring in the Army. Shoot looters and arsonists on sight". So what is the law relating to rioting and arson? In 1715 the Riot Act was brought in to deal with civil disturbances. Specific wording from this act had to be read out before the crowd. If the crowd did not disperse after the act was read, lethal force could legally be used against the crowd. This act was removed from the statute book in 1973, and later replaced by the Public Order Act 1986. Section 1 of this act refers to the offence of Riot. This offence of Riot requires there to be at least 12 people present, and if less than 12, the lesser offence of 'Violent Disorder' is charged. It is patently clear that in the latest riots, more than 12 people are involved, so the serious offence of Rioting can be brought against every single convicted individual. The worrying thing is that this serious charge of Riot has rarely been brought. Why? Did you know that the local police service are statutorily liable to pay compensation for losses and damage caused by Riot? Many of you will remember the Poll tax demonstrations of 1990, where nobody was charged under Section 1 of the act. All were charged under the lesser 'Violent Disorder' offences, as though a collection of these offences had just happened to take place in one location. This was justice driven by money, not by law. Riot is an indictable offence under the Serious Organised Crime and Police Act 2005, and is punishable by up to ten years imprisonment. Currently over 600 people have been arrested in London, and I'm sure that each one qualifies to be charged under Section 1 of the Public Order Act 1986. Send each to prison for the maximum period of 10 years. That's one powerful statement to say that public disorder in the form of rioting will not be tolerated. The power is there to do it, but I fear that what we will get is, "You've been a naughty boy. Go away and don't do it again". Arson comes under The Criminal Damage Act 1971, and comes under different levels of seriousness. I've had a number of convicted arsonists as clients over the years, and each one were loners who liked to set fire to things for the thrill of seeing the flames. Each was different in the seriousness of their crimes, and in their mental state, and this was reflected in the different sentencing they received. The morons who rioted and set fire to cars and buildings are a different breed, but are none the less guilty of arson. Looking at the Crown Prosecution Service guidelines to Judges, and examples of case law, the average length of prison term for those convicted ranges from two to six years. However, the law allows for sentencing for serious arson attacks to be life imprisonment. Will those convicted rioters and arsonists be dealt with seriously? I very much doubt it. Please let there be no more enquiries, no more studies, no more reports into the lives of certain city dwellers. We've had social condition reports coming out of our ears. We've had millions poured into deprived communities. We've had endless initiatives on employment and activities, and as one Residents' Association local Chairperson said on the news tonight, "We've provided so much for our young people, but they won't use it, I'm banging my ahead against the wall". Please, no more. Many will disagree with my hard stance, and my views have no doubt changed over the years, but if the full force of the law is not to be brought down on the heads of convicted perpetrators, I ask again. Who is in control? And what is to be done?